For about the price of a family vacation, an aboveground swimming pool will typically be enjoyed by your family for 10 or 20 years. 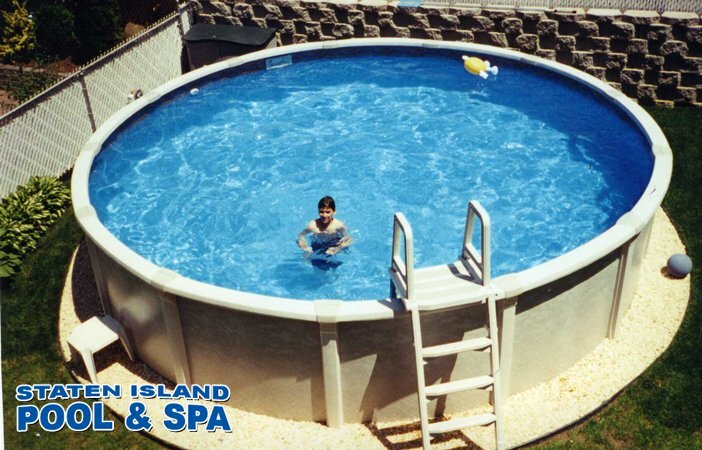 With our great selection of models and sizes, and hundreds of pools in stock for immediate delivery, you will always find the best deal on an above ground pool from Staten Island Pool & Spa. You can use our Custom Pool Package Builder to select and buy the perfect pool package right now online! Click here to see our available above ground swimming pool models, sizes and sale prices. 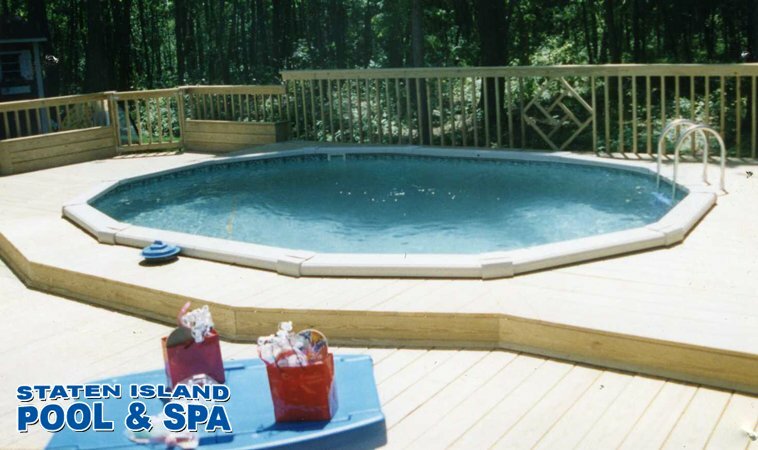 At Staten Island Pool and Spa, we offer the maximum amount of above ground sizes. We specialize in accommodating both small and large backyards, and our close relationship with several manufacturers allows us to stock special sizes you will not find anywhere else. Need an 8×12 oval? 10×16 oval? We got it. A 12×24 oval would be a little too big for your yard, but a 12×21 or 12×20 oval would be perfect? We got that too. Looking for that large aboveground pool to fit your whole family? How about a 24′ round or try our 15×30 or 18×33 ovals. With round pools from 10′ to 33′ feet in diameter, and oval pools from 8’x12′ to 18’x40′, we will have the perfect size for your backyard. With hundreds of pools in stock, there’s is no waiting for what you need. Most above ground pool manufacturers make both round and oval pools. If you have the space and you are looking for value, a round pool is the way to go. Because round pools do not require extra support the way an oval pool does, there are less components and they are less expensive to manufacture. Because round pools have less components, they are also easier and less expensive to install. 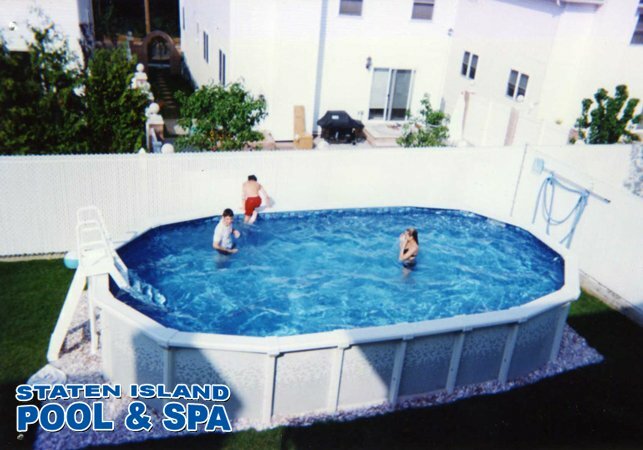 Many people with smaller yards prefer oval pools, and with over 17 oval sizes to choose from, Staten Island Pool and Spa is certain to have a size that fits your requirements. The support systems on our oval pools feature a space saving buttress-less system. This system is supported by steel beams and straps that are recessed under the pool, eliminating the need for poles or angled braces sticking out of each side of the pool. The buttress-less system allows more pool size while occupying less space, and are perfect for small or narrow yards. The showroom at Staten Island pool and Spa is open 7 days a week (click here for showroom hours and directions) and has 7 full sized pools on display indoors. Come on in and talk to our experienced staff about your above ground pool needs. Be sure to bring in the measurements of your yard and where you would like to place your new pool, and we can show you the available styles and sizes to suit your space. Bringing in a few digital pictures of your backyard on your digital camera will also help us pick out the exact right pool for your yard. And don’t forget to take a look at our pool gallery to see pools that we’ve installed throughout the area. You can also use our Custom Pool Package Builder right now to buy your perfect pool package online. Select your pool size, liner pattern, filter package, ladder options and accessories like lights and automatic pool cleaners all from the comfort of your home, and we’ll deliver it right to your door.